I was fortunate in watching a demonstration by Simon Hope at the Tudor Rose Woodturners prior to my writing. There he showed how effective the tools are in use. Some years ago I purchased a similar un-powered sanding system and the main problem was that it was not very solidly constructed. The same, however, cannot be said of the Simon Hope system. The sander is constructed of aluminium with a warm-to-the-touch overlay for the handle. The head is also of aluminium with double bearings, a rare earth magnet holding the sanding pad securely, and the head is rotational through 45 degrees in one plane. 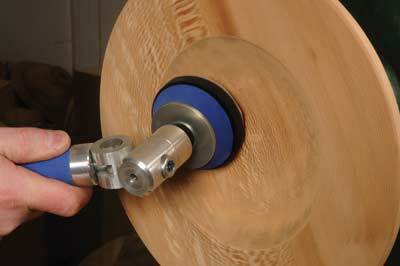 In use it fits the hand well, is easily adjusted and utilises both 50mm (2in) and 75mm (3in) diameter sanding discs affixed by a hook-and-loop material. To test the capabilities I turned both a 150 and 430mm (6 and 18in) diameter platter in sycamore and a set of napkin rings in blackthorn. The 150mm (6in) platter could only be sanded using the 50mm (2in) discs and the sander performed well, if erratically, but this I put down to my own inexperience! The 430mm (18in) platter had moved as I turned it flat and became somewhat progressively undulating as time progressed. This produced a marked vibration through the sanding head and I found it difficult to keep the angle locking mechanism locked. There is a hole provided for a Tommy bar - not supplied with the tools - but after locking it tight, I experienced difficulty in unlocking it again to change the angle of attack. I found difficulty in holding the sander one-handed due to the speed of rotation of the sander and vibration, but the head fitted comfortably to the hand and work proceeded relatively easily. The sander redeemed itself with sanding the outside of the napkin ring cylinder, and once the correct angle was established, it proved very effective in producing a wonderfully smooth finish. I used it again after parting off and for sanding the two ends of each ring. Speed of finishing was good even though I worked my way through grits 120-400. Although, if tooling marks are heavy it was understandably slower at removing some even with 80 grit discs. 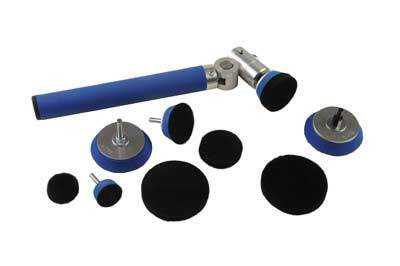 The sander is well made, easy to use and hold. Getting the correct angle of presentation to the work does take time to learn, but once sorted this type of unit is a delight to use. Yes, the locking off and releasing of the head was a little tricky, but it did not shift in use, which is vital for control. The magnet in the bottom of the pad holder keeps everything in place and the pads supplied are very well constructed.